This post has been brought to you by http://www.stethoscopepros.com/ helping you to evaluate the best stethoscope there is on the market. Snailfish live almost 8,000 meters deep and their bodies are so fragile that they melt when they are caught. An international team of scientists have discovered and filmed several specimens of three unique species of semitransparent fish that live almost 8,000 meters deep in the most unknown marine areas of the planet, the Atacama Trench (or Peru-Chile trench). The body of these deep-sea fish is so fragile that it practically melts when captured and brought to the surface for study. Provisional data indicate that there are three new species related to the family of the snailfish of the Marianas (or slugs of the Liparidaefamily ), whose first specimens were discovered in the Mariana Trench. The expedition to the deep waters of the Atacama Trench has the participation of 40 scientists of 17 nationalities and is financed with the help of the Ministry of Education and Research of Germany. And the Hades project of the European Council of Scientific Research. The three new species of snailfish are now under study and their final classification is pending official publication. For the moment, those responsible for the expedition call these species pro their colour: pink, blue and purple. The authors indicate that the fish identified and filmed live are small, translucent, lacking scales and very able to live where few other organisms can. “There is something in these species of snailfish of the Liparidaefamily that allows them to adapt to a very deep life; beyond the reach of other fish, where they are free of competitors and predators, “says Professor Thomas Linley of the University of Newcastle. “As the video clearly shows, on the seabed, there are many invertebrate prey and the snailfish are the main predators; They seem to be quite active and they look very well fed, “says Thomas Linley. The scientific team responsible for this expedition managed to film some of the snailfish, depositing on the bottom of the sea – in the form of a trap – the body of an amphipod in one of the traps. One of the captured specimens is in good condition and, after careful preservation, is being described by the team at the University of Newcastle with the help of scientists from the United States and the Natural History Museum of London. In addition to the snail, the team also filmed some amazingly rare images of long-legged isopods, known as Munnopsids, which are the size of an adult hand. These crustaceans have small bodies, extraordinarily long legs and swim back and down, propelling themselves with paddles on their ventral side – their ‘belly’ – before straightening on the seabed and unfurling their long legs to walk like a spider. The Atacama trench or Peru-Chile trench is about 6,000 km long and, in some points, exceeds 8,000 meters in depth. It extends along the west coast of South America around the edge of contact between the oceanic lithosphere of the Nazca plate and the continental lithosphere of the South American plate. Previous scientific reference article: Pseudoliparis swirei sp. 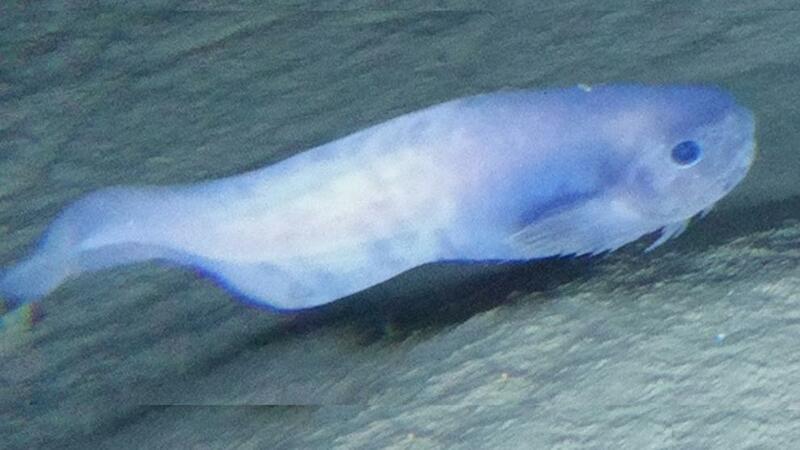 nov .: A newly-discovered hadal snailfish (Scorpaeniformes: Liparidae) from the Mariana Trench.